FM have been somewhat prolific since reforming for 2007’s successful Firefest headlining appearance, the ‘Wildside EP’, Metropolis album, from which the single ‘Hollow’ made its appearance on Radio 2, something that guys couldn’t achieve the first time around. They have even been invited to some of Europe’s biggest and baddest festivals the past couple of years – Download (UK), Graspop Metal Market (Belgium), Rock the Nation (Germany), and a couple of gigs at some decent venues I didn’t expect to see FM frequent at this stage in their careers, but exceptionally pleased that they have – especially the support for Journey last year in Dublin and Belfast. Plus their own headline gig at the Sala Heineken in Madrid. Its these (successful) gigs that make up the DVD. Apart from one instance (Bad Luck) FM have avoided the duplication issue by not containing the same song from different venues, which gives the DVD more of a ‘set list’ feel. Belfast sees FM perform one of their best loves songs, ‘Bad Luck’ complete with the usual high quality harmonies from all concerned. Why can’t more bands all harmonise like FM? Dublin sees FM play what used to be my fave opener of theirs in the late 80’s, the pulsating and more potent than the CD version, ‘I Belong To The Night’ and their performances are so consistent, the Dublin and Belfast gigs are seamless in quality and continuity. Even the stage clothes are identical. The audience response at the end is one that has the hallmarks of being blown away. Download are treated to ’Wildside’, probably the most in yer face rocker that FM have ever performed and prove that in 2012 their music is still relevant, and they’re not just a) making a fast buck, and b) here to make up the numbers for Download. Loreley sees FM use an almost new and pioneering technique for performing the AC/DC riff inspired ‘Flamingo Road’ whereby the video is ‘slowed down’ to an absolute minimum. This new process is called photography! This special section is for those who may suffer from severe epilepsy, and risk having a seizure from watching FM perform at such high speed. One of the highlights of this Rock The Nation section (for me and possibly many others) is an almost ‘blink and you will miss it’ section of some FM rarities – dodgy 80s pics, poodle perms, Merv’s legendary pink suit, shoulder pads, lamé jackets, ticket stubs (£4.50 !! Before Ticketmaster started taking the piss), magazine articles, album, single and many tour promo posters, and some wonderful gig reviews. They even made the front page of Kerrang! back in the day (29/7/89). Get that ‘pause’ button ready. Wonderful stuff! GMM (Graspop) has the biggest section on show. Played in front of a small (for a festival) but I must say, a won over and appreciative audience (especially the two metalheads seen on Bad Luck)– they are hit hard with ‘That Girl. Dont Stop, Bad Luck, Burning My Heart Down, and Grapevine’ and is the most professionally shot set of the DVD. The various sections all contain little snippets of clips shot in and around the venues, just in case you think its all been made up. There is also a decent Bonus section, their first appearance in years (20?) at the Hammersmith Apollo. Good times indeed! Aptly named ‘The Hammersmith Apollo Bootleg’ as it’s a gig that looks like it’s been recorded by a camera with ‘home video’ stamped all over it, and with some bass vibration when shot from a distance. In saying that, it’s not Hollywood, but it’s not shabby either. The sound is just OK,and the set is definitely from the ‘hit the audience right between the eyes’ school of set lists. The gig was supporting Thin Lizzy, a band I’ve occasionally thought that FM get their direction from, especially in ‘Face to Face’. Even with the sound from this Hammersmith gig being not so perfect, Overland’s voice still sounds great. The picture isn’t always brilliant, the audio has one option, but for the price, it makes for exceptional value witnessing a band who 25 years later are still sounding as good, if not better than ever, and is nice to see them enjoying the festival experiences that they didn’t seem to get the first time around. 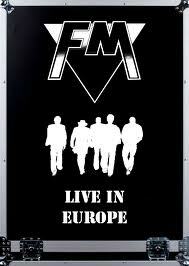 I just hope the guys had the foresight to record the recent Indiscreet 25 gigs, as that was the best I’ve EVER seen FM. There’s life in the not so old dogs yet. Long may they continue putting out albums and DVDs like this.